Kravetz considers his job at the helm of WBUR the best one of his life and credits the mission-driven work of public radio for giving meaning to his days. Kravetz puts it this way, "As journalism struggles in the digital age, it is a source of pride that public radio remains true to its values and continues to serve millions of people across the coun- try with quality news that is deep and serious and engaging and non- partisan." Kravetz calls WBUR one of the two or three greatest radio stations in America and feels comfortable bragging because he took over an already impressive organization. "When I started my job five years ago, people told me two things: 1. Congratulations. 2. Don't screw it up! I think I've abided by that admonishment and somewhat more. I hope that WBUR will continue to grow under my guidance and will serve Boston with even more wonderful programming and news in the coming years," continues Kravetz. Through his stewardship of WBUR, Kravetz serves Boston in more ways than through news and programming. He has an opportunity to develop deep relationships with countless other nonprofits in the city. 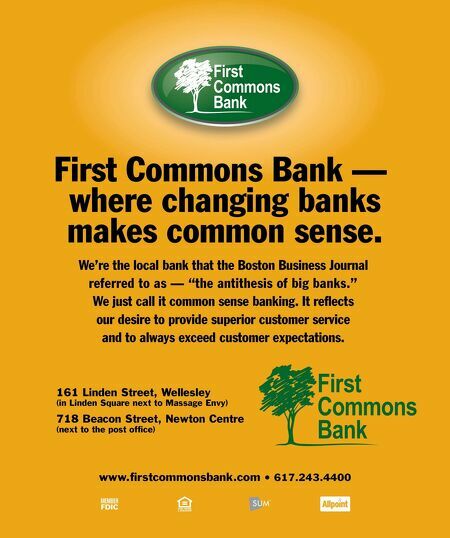 WBUR is the largest sponsor of the Boston Book Festival. It also collaborates with the American Repertory Theater, Huntington Theater, Boston Children's Museum, The Museum of Fine Arts, Boston Symphony Orchestra, and the Boston Foundation. A drive to innovate for the public good has long powered Kravetz's career. He was the founding news and programming director of New England Cable News (NECN). "In early 1992, I launched NECN as a 64 W e l l e s l e y W e s t o n M a g a z i n e | s u m m e r 2 0 1 6 an interview with charles kravetz "When I started my job five years ago, people told me two things: 1. Congratulations. 2. Don't screw it up! 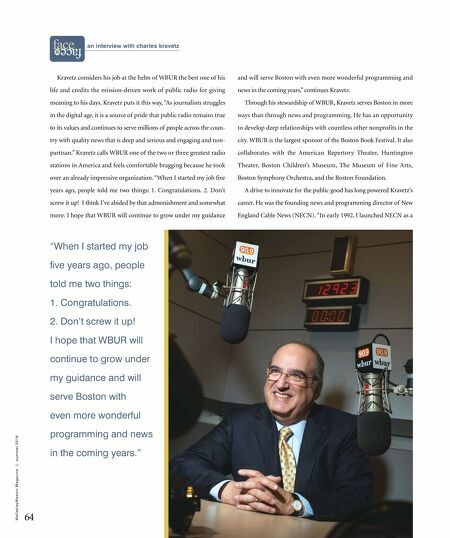 I hope that WBUR will continue to grow under my guidance and will serve Boston with even more wonderful programming and news in the coming years."